An arch-stylist seemingly bent on committing the human subconscious directly to film, Guy Maddin has consistently populated his films with Freudian twists and signifiers in such an open, brazen way that it’s hard to read them as anything but confessional. However, these confessions are so radical, so pronounced, that in their excess they border on glibness. Maddin is forever in danger of wandering into irony, but the term does not really apply to his films. His mock-serious use of anachronistic clichés (whether cinematic or cultural), loaded psychosexual characterisations and bizarre non-sequiturs bring his films to the edge of parody, and yet they often work as genuinely emotional experiences. Although his films seem to exist in a universe all their own, Maddin is very much a genre filmmaker. He makes melodramas, and he understands that the key to the great Cinemascope soap operas by Ray and Sirk was a healthy balance of the ridiculous with the sublime. Perhaps Maddin’s films work so well because, on some level, he realises that the artifice and affectation that make up his films’ DNA are defense mechanisms. His films flaunt their artificiality in a way that suggests a post-modernist’s awareness of the cinematic apparatus, but his jokey self-consciousness expresses an intense appreciation for the dramatisation process’ wonderful absurdity. For Maddin, irony does not negate sincerity, but instead points towards its repression – one of his favourite themes. With his two most recent films, as disparate in tone and in style as anything in his filmography, Maddin has begun to investigate the implications of his own method. 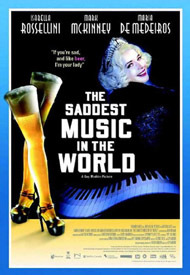 The Saddest Music in the World (2003) is not coincidentally his first film to receive a major release in the United States. Featuring genuine stars (Isabella Rossellini and Mark McKinney, of Kids in the Hall fame) and a breakneck script that keeps the jokes (or near-jokes) in constant supply, Music is Maddin at his most accessible. The editing is swift but unobtrusive and the images are crisp and glossy, while the blatantly phony sets provide the perfect backdrop for both McKinney’s chipper deadpan and the hyper-theatrical melodramatics of his costars. Cowards Bend the Knee (2003), on the other hand, is an intensely private film. Originally designed to be a peepshow installation (with each of the film’s “chapters” housed in a separate machine), the 60-minute film is wholly mute. Where Saddest Music overflows with glossy kitsch, Cowards is murky and grainy and, despite the usual neo-Surrealist incongruities, brimming with genuine tragedy. In addition to the aforementioned familial competition, Music throws various romantic rivalries into the mix. Family patriarch Fyodor proudly represents Canada, despite an apparent lack of musical ability, while his son Chester (McKinney) produces the American entry. Chester, a penniless Broadway producer, hopes the prize money will let him mount another show. Port-Huntley’s former lover, Fyodor hopes to win her back. Port-Huntley, however, has not forgiven him for the drunken surgery he performed years ago that left her legless. She is more inclined to forgive Chester, with whom she also has a romantic history, even though she despises his glib personality. Chester’s brother Roderick, now known as Gavrillo the Great (after the assassin commonly credited with starting World War I), arrives bearing the weight of Serbia’s collective sorrows. Chester’s current lover is Narcissa (Maria de Medeiros), an amnesiac/nymphomaniac who, it appears, is Roderick’s long-lost wife. In the logic of the film, this statement is more than a mere denial of grief. Just as Chester is unwilling (or, at this point, incapable) of feeling sadness, neither does he feel happy. For all his “razzle dazzle”, in life or on stage, love and happiness elude him. His own joyless existence is contrasted with that of his brother, whose sorrows have nearly paralyzed him. An overly-sensitive individual, Roderick can only feel such depths of grief because he was once happy, and assumedly still has the capacity for redemption because of it. And then there’s Narcissa, who, the film implies, was so devastated by the death of her son that her system shut down and erased her memory entirely. Just as Narcissa’s ignorance of her sorrows stems from personal tragedy, the film implies that Chester’s wilful avoidance of them can be traced directly to the death of his mother. The true foil for Chester, however, appears in Saddest Music‘s unofficial companion film, Cowards Bend the Knee. Focused on a single character, “Guy Maddin”, Cowards is the filmmaker’s attempt to maintain his feverish style while removing any hints of kitsch or irony. While his girlfriend Veronica lies dying in the back room of the local hair salon/whorehouse, hockey star Guy abandons her for a mysterious beauty named “Meta”. Although Meta returns his affection, she won’t let him touch her until a surgeon replaces Guy’s hands with those of her dead father – which are blue from his years of dyeing hair at the salon. The corset-clad, cigar-smoking surgeon fakes the transplant by painting Guy’s hands while he’s under anaesthetic. Guy, thinking his hands to be those of Meta’s father, can no longer bring himself to touch her in a sexual way. Seemingly possessed by his hands, he becomes a murderer, choking friends and foe alike, vaguely seeking to revenge the death of Meta’s father. Meanwhile, a new hairdresser joins the staff – Veronica’s ghost. Unaware of her true identity, Guy falls for this new beauty. Not interested in Guy, she falls for his father. Once Guy completes his revenge by strangling Meta’s mother, she cools towards him and demands the return of her father’s hands. She and the surgeon forcibly remove them. All this comes to a climax when a handless Guy attempts to conjure the help of forgotten hockey heroes in a wax museum to force his father away from Veronica’s ghost, who has just accepted his marriage proposal. The figures come to life and instead chase Guy. There is a brief reconciliation between Meta and her father, one of these temporarily-resurrected figures. The nearly delirious Guy now learns that the museum was not for heroes but for cowards, men who were not brave enough to face the prospect of living a day-to-day life with a wife and children. The film closes with Guy now part of the museum himself, one wax figure among many. As the above descriptions suggest, there are strong similarities between the heroes of these two films. Like Guy, Chester is not content staying with a single woman. Both are driven by sexual compulsion more than love (or even desire as traditionally understood), and have no emotional ties to keep them in one place. Their romantic competition is their own family, a source of great humiliation for both. Most importantly, the two characters are emotionally stifled, unable to be truly happy or truly sad. Both their downfalls are brought about by their inability to be happy (or at least satisfied) as much as their repression of a healthy person’s sense of sadness. There is an element of Maddin the filmmaker in Chester’s role as a “producer of musical extravaganzas”. Where Chester believes in the artifice and theatricality of showbiz, the film reflects that artificiality. Chester conceives sadness through showmanship. Maddin’s own filmmaking methods, comparably, occasionally seem to hide genuine emotions under layers of stylish kitsch. His actors’ line readings are often hilarious, even during his films’ tragic high points. Maddin knows how easily his flourishes can distance an audience, but his self-conscious use of them here can point one towards the genuine feelings at the core of the work. The fact that he has to deal with them so indirectly, even flippantly, is in itself evidence of their depth. The more powerful an emotion, the harder one must work to cover it up, and that’s largely what Saddest Music is about. Cowards, on the other hand, contains no such peripheral distractions, besides, of course, its absurdly complicated plot. Wild melodramatics once again bring the ridiculous to a depressing, tragic work, but they have been largely drained of their theatricality. Psychosexually-speaking then, the film is much more troubling, as if Maddin is working for the first time without the safety net of kitsch. His psychological details are more precise than they’ve been in previous works. Here, sexual obsession is based on concrete details: a character’s breasts or hands, or specific sexual encounters, rather than the abstracted Oedipal mother of Careful (1993). The absence of a soundtrack, and therefore all spoken dialogue, removes perhaps the kitschiest element of Maddin’s films. Even with all its absurdity, the film allows the audience to dig inside the drama without the same sort of distancing effects to be found in Music. Only an hour long, the film often moves with an Eisensteinian rapidity, although the montage is severely limited in scope. Flashes of images are often used as scene transitions. Difficult to identify, these half-legible images are revealed by closer examination to be either brief extensions of the action or selective re-playing of what was just shown. They come from the images we’re already seeing. Hermetically-sealed as it is in its editing, and trapped by its own fever-dream logic, Cowards is an excessively claustrophobic film down to the level of the individual frame, which often seems in danger of being overtaken by the shadows that already obscure much of the image. It’s Maddin’s first film that demands emotional participation from the audience. Despite its period setting, Music has more to do with the contemporary world than anything else Maddin has done, while Cowards exists in a very abstract space. Music contains a rather imaginative critique of American economic imperialism and Western exploitation of the third-world (reportedly even more prominent in the original script, written by Remains of the Day author Kazuo Ishiguro) (1). During the competition, Chester prowls the street, looking for poor foreign musicians he can recruit for nothing more than the promise for a ticket home. Meanwhile, Port-Huntley is ready to wring money from American families even when they don’t have enough “to buy their children shoes”. Port-Huntley’s excess of sorrow and its total absence in Chester engender a similar self-involvement and an inability to sympathise with others who may be suffering – a significant critique from a director whose films regularly throw his characters into the depths of inexplicable tragedy. Maddin’s Canadian-ness plays a large role in both films as well. The premise of the contest, and Canada’s own unexceptional entry, suggest that Maddin is dealing with his country’s lack of an explicit national identity. Through Chester and Roderick, and through this worldwide contest, Canada attempts to define itself strictly in the terms of other nations. However, as the film’s ethnic representations remain strictly in the realm of stereotypes, Maddin is concerned primarily with the world’s perception of Canada, which is nearly non-existent. Here, once again, Cowards seems to respond directly to Saddest Music, as the story begins in the most cliched of Canadian national institutions, professional hockey. Yet its concerns are personal and psychosexual rather than social. The prominence of a hair salon – reminiscent of the one owned in real life by Maddin’s aunt, discussed at length in his DVD commentary for Tales from the Gimli Hospital (1988) and elsewhere – suggests elements of a private autobiography unavailable to most viewers. One can only guess whether other details have a similar personal significance for Maddin. Whatever the answer, Cowards feels confessional, as if everything has this autobiographical resonance, not least because its hero is named “Guy Maddin”. The sheer brazenness of the Freudian sexuality and psychological incongruities in Maddin’s work, not to mention the films’ narrative and symbolic density, make psychoanalytic interpretation somewhat daunting, perhaps even ridiculous. To fully explicate a plot as complicated (or, if you prefer, convoluted) as Cowards or Saddest Music, all the while keeping an eye towards the cinematic style that offers a running commentary on the content, is far beyond the ken of most viewers and critics. Therefore, critics have avoided such readings of his films despite blatant signposts (i.e. literal Oedipal fantasies, amputations, etc.) that seem to demand them. With his two latest films, Maddin tries to direct critics and audiences back in that very specific direction. In the process, he has perhaps allowed more of himself to emerge than he has at any other time in the past. In making two very different films that complement each other so perfectly, Maddin almost seems to be asking critics and audiences to decide for themselves whether he is merely a stylish ironist or a living, breathing, feeling human being. The Saddest Music in the World will screen at the Melbourne International Film Festival on 23 July and 7 August. Cowards Bend the Knee will screen at the Melbourne International Film Festival on 31 July and 6 August. Jonathan Rosenbaum, “Crying in their Beer”, Chicago Reader, May 14, 2004.